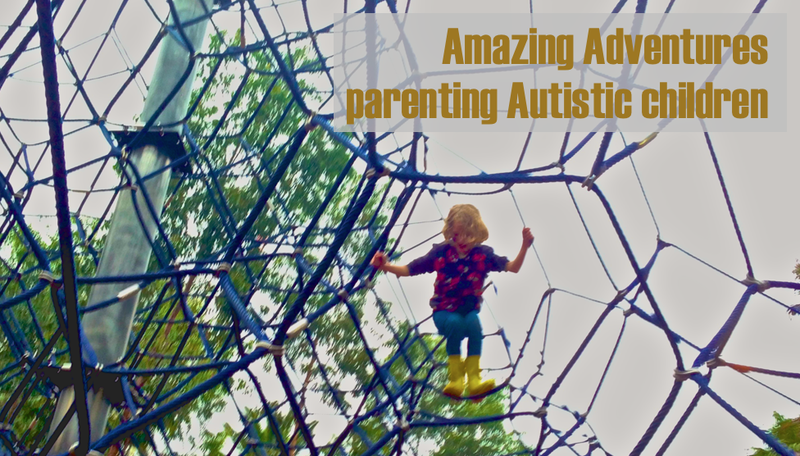 Amazing Adventures: Q&A 1: How do Autistic children see the world? One of the responses was about perspectives- how do Autistic kids see the world? What is their perspective, what is different for them? Thanks to Technology Hubby, I can actually show you some of the difference in this video of Ls photos taken when he was 4 years old. Of course this is a rather literal answer to the question about how they see the world!! But you will notice that there are a lot of corners in his pictures, and very few faces, even in the photos that have people in them. Other differences in physical perspective are that kids on the Autistic spectrum often find light brighter, sound louder, smell stronger, taste more intense and touch painful. A less literal interpretation would be to talk to you about how Autistic children perceive the world. This is harder to answer. The best example I can think of from my own experience as a non Autistic person is to liken it to living in another country. When I was 11 my family moved to Papua New Guinea. It was hotter, stickier, brighter, the sounds were all different, the routines of the day were different and people kept speaking a language I didn't understand. Over time, I got used to the sound of the language, and could understand what was being said. When more time had passed and I had practiced a lot on very patient people I was able to speak the language. I became more used to the weather and started learning customs of the culture. I didn't feel so silly all the time, but it took a lot of concentration to make it seem like I knew what I was doing. I still sounded different than the others when I spoke, but they could at least understand me most of the time. It is a simplistic example, but it is a start. I am sure that my Autistic kids feel a little bit similar to what I did learning to live in PNG. They don't learn social conventions automatically like most of us just by observing and practicing because their brains do actually work differently than ours, and so they don't see all the same information we do when we are looking at the same things. A real life example of this (in the broader sense of seeing things differently) is when G and I walk down the street- I see people, cars, shops... she sees cracks in the path, places where textures and patterns change, flashes of light reflecting in windows and if there are birds around she stops and looks at them (she loves pigeons!). A specific example of Autistic children not learning social conventions easily is that when G was young she didn't understand that someone being in close proximity to her did not necessarily mean they were interested in what she was doing. This resulted quite a few instances of people being clobbered by her for walking past while she was sitting on the floor with a toy, as she assumed they were a threat to her game just because they were close by and she was not able to use her powers of observation to determine that they were just walking past, were not even looking at what she was doing and therefore probably weren't interested in her toy. It is common for Autistic children to have what is often called an Obsessive Interest. In our house hold this has looked different for each of our ASD kids. For L it manifest itself in a series of favoured toys or activities. These interests are in normal things, but last for abnormally long periods of time and are not just an interest but a true obsession, in that L will talk about them all the time. You need to understand that as a parent I sometimes say things like "All I do is wash dishes and clothes" and that is an exaggeration. This is not one of those type of statements. When L was interested in Bionicles (and he still is, but not so intensely as the 5 years he was actively collecting them) he played with them everyday for hours, he drew them, he designed new ones of his own, he wrote stories about them, he wanted to watch movies about them, he would only read a book if it was about them, and he talked about them all the time (or at least until I actually considered getting myself some earphones so it would look like I was still listening but could have a break). Other Obsessive Interests for L have been Hot Wheels, Dinosaurs, microscopic animals, and various computer games. G's Obsessive Interests work a bit differently. They are often around a movie or more recently a Musician or Band. At the moment, if I let her, G would listen to Coldplay's "Paradise" non stop. It was a bit easier to cope with the previous musical interest as it was a whole album by Gorillaz, and we didn't have the same song stuck in our heads all the time. Before that is was Michael Jackson. When one of G's musical interests starts getting too much for the rest of us, we go looking for other songs we think might grab her attention and play them, hoping for the best.... or at least for a change! Previous movie obsessions have included Alice in Wonderland, Moonwalker and Avatar. G can also be a bit obsessive about what food she wants to eat or which clothes she wants to wear. Both L and G find a lot of comfort in involvement in their Obsessive Interests and use them to help calm themselves when anxious or upset, and as a default topic of conversation when they feel socially unsure. One other difference in the way Autistic children perceive the world is evidenced in their reaction to change. Very few of us really like change, I suspect. I know it makes me uncomfortable! For an Autistic child change causes real distress and anxiety. It takes a long time to get used to the idea of a new school, let alone be able to function well there, and much time is spent in preparation for these sorts of changes in our family. Some who read this will think, "but my child didn't want to go to high school, either...", and I acknowledge that changes like that do make all of us nervous. The difference lies in the strength of the discomfort. For most kids, a couple of visits to the new place, a bit of discussion about what it will be like, and they are OK to go. For L to go to high school took much more preparation than that. We had many extra orientation visits, Hubby and I went and met his year advisor and the support staff to talk with them about L and how he will need help. All kids feel a bit overwhelmed navigating the hallways in a new school, L needs practice with the help of a responsible peer or adult when the hallways are quiet before he will be able manage the trip between classes alone when the halls are full. G's transition to preschool took a full 10 weeks of practice visits 3 days a week starting with a half hour visit with me by her side the whole time, to slowly working up to being able to manage to be there for 3 hours and being comfortable going to the nearest staff member for help with a problem. In contrast, K went to preschool quite happily after one half day visit 8 weeks before she started. G's active transition to school has already begun, 12 months before she actually starts, and that doesn't count the playground awareness training I've been doing with her since K started school over a year ago. K went to school with more excitement than nerves, after 3 1 1/2 hour orientation visits. Well, I don't know if I've actually explained very well what the differences are, or if I've more told you what they look like from the outside...? Still, it's all about making people more aware of Autism, and I guess I've done a bit of that! Over the next few days I'll be attempting to answer some more questions from people who don't know much about Autism (and there have been some great ones asked!! ), before moving on to talking about what parents of Autistic kids feel they need most. thank you for sharing these photos! Such a wonderful insight. Loving all your posts! This is a great post Michelle - I missed it the first time around, so thanks for re-sharing! Glad that you are getting hits on this every day. I have a similar experience with one of my posts "The Emotions of Autism" - ever since it was published it's been the biggest post every day. It's funny how that works, I really wish I knew the secret formula so I could bottle it and replicate it! Thanks for these photos - they are strikingly similar to my own son's who is nearly four. I loved the one with the foot just in the corner - we have a whole collection of these! Like these photos he likes to take photos of light shinning off objects and of contrast in light and is fascinated with textures. He's taken some stunning photos. Wonderful blog, which I've just discovered, but I had to comment on this post. Thank you for your refreshing take on parenting and autism - its just what I needed to read right now.